The Curran Investment Committee views the changes to the GICS Sectors as unequivocally positive. 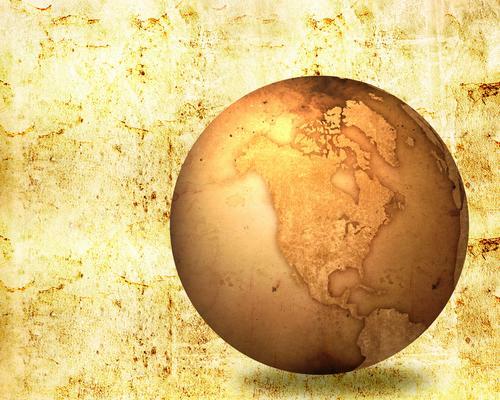 This article is a follow up to our article last week discussing the changes to the GICS Sectors which took place in the fall of last year. We welcome the creation of a new Communication Services Sector. The old Telecommunications Services Sector was very small: < 2% of the S&P 500 companies’ market cap weighting. Not only was the old Telecom sector small but it consisted of highly indebted companies which exhibited little to no sales and earnings growth. The new Communication Services Sector is approximately 10% of the S&P 500 and we do have exposure. So for starters the sector has gone from a small size, consisting of only a few economically significant companies, to a large presence which will be difficult for investors to ignore. Consider that Communication Services provides investors with a significantly new economic sector, one that potentially provides investors with growth–oriented exposure, with lower leverage, higher operating margin and consistently high returns on shareholder equity (ROE). This should sound familiar. These are all traits that we seek in identifying the highest quality companies for investment at Curran. As a result, investors have more opportunities within GICS Sectors to seek investments in quality growth companies. Our investors immediately have exposure to the new Communications Services Sector. Walt Disney Company (DIS), Facebook (FB) and Alphabet (GOOGL) are all part of the new sector. Disney moves from Consumer Discretionary, while both Facebook and Alphabet will move from Information Technology (IT) to Communication Services. As an aside, the company formerly known as Google has changed its corporate name to Alphabet. The changes enhance the committee’s flexibility to buy more companies in potentially three sectors. Whereas before we had overweight exposure to both Information Technology and Consumer Discretionary, we now have significantly less exposure to the newly constructed sectors that makeup the S&P 500. Prior to the change, the Investment Committee considered Core Growth to be at its maximum sector weight in both IT and Consumer Discretionary. Theoretically, we could now increase our industry exposure by purchasing companies that would have been prohibitive in the past. For instance we do not own any companies from the Software or Semiconductor industries which are sub-categories of the IT sector. 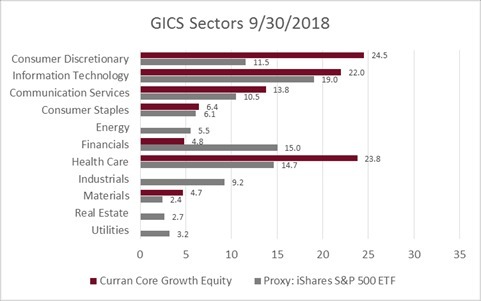 I am not suggesting we will buy companies in these industries now, but whereas before we considered the Core Growth strategy to be at a maximum weight in IT and Consumer Discretionary, we now have the flexibility to further seek investment opportunities in three sectors: IT, Consumer Discretionary and Communication Services. The bar charts below illustrate the sector makeup of both the S&P 500 and Curran Core Growth Equity before and after the changes took place. 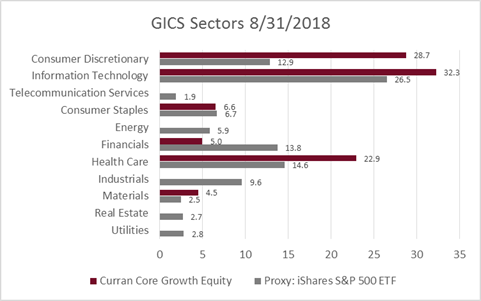 The three sectors impacted are Consumer Discretionary, Information Technology and Telecommunication Services, which is now known as Communication Services. In summary, the Investment Committee views the changes positively. A small Telecommunications sector has been incorporated into a new, more dynamic Communications Services sector. The Investment Committee does not view the legacy Telecom sector as investable. By that I refer to not only it’s small size (< 2% S&P weight) but also the Telecom companies do not exhibit the investment metrics and qualities that we consider as requirements for investment in only the highest quality companies. The new Communications Sector does meet the requirements and we currently own three of the companies: Disney, Facebook and Alphabet. Feel free to contact your Curran Relationship Manager or a member of the Curran Investment Committee with any questions. or contact Curran Wealth Management if you have any questions.